Congratulations to all the newly engaged couples of York Region! We are here to help you learn to dance for the most important day of your life. Bridal shows are a great way to find out what services are available in your area. We recommend going local! For example, The “Dreams to Reality Fall Wedding Show” offers a plethora of unique Bridal services in York Region. Hosted by Anita’s Events, this unique wedding show includes a cocktail reception, live entertainment, contests and a bridal Fashion Show By Gown Go Round through Sharon Temple’s timeless hallways! Artistica instructors were there to demonstrate what an impressive first dance can look like. In addition, our wedding dance students, Tamas & Philippa demonstrated their first dance they have been practicing for their wedding. There is no doubt how much thought and effort goes into planning your wedding. So much planning that sometimes we skip over an essential part of the day – THE FIRST DANCE! That is where we come in. 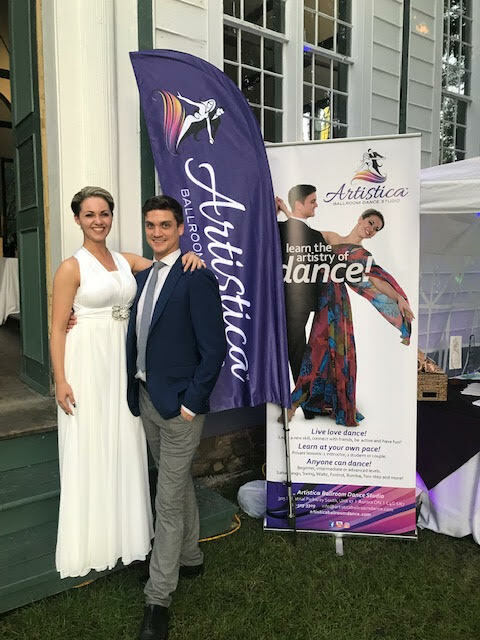 Artistica has helped countless couples with two left feet achieve a stunning dance with simple steps, turns and even a stress free dip to tie it all together. Reading this, we bet you’re thinking this all sounds great… in theory. How do I convince my partner to take dance lessons? Easy. Remind them what a “slow dance” looked like from grade 8. Chances are it had you swaying from side to side, one step at a time. Hands on shoulders, arms extended, about 2 feet from each other. If that sounds familiar keep reading. Tell your partner you want to “make a memory”. Aside from the actual dancing part, the time spent learning together is filled with fun and laughter at our studio. Let’s pick a song! There is always that special song that the two of you agree should be your “first dance song”. This song can be anything! Fast, slow, funny, instrumental, polka… anything as long as it resonates with both of you. CALL ARTISTICA! We offer a FREE consultation meeting with us to chat about your wishes for your wedding dance. We offer our expertise and come up with a plan to get you there. MOST IMPORTANT PART, leave yourself enough time to learn and practice. We suggest to start as early as possible, the more time the better. As a guideline, try to get started 1 month (minimum) before your wedding day. Because everyone learns at their own pace, therefore we want you to feel great! Our repertoire is vast, and we can teach ANYONE, so please don’t be shy. We are here to help you look and feel great on the dance floor!